Augmented Reality refers to any system that overlays virtual objects or information on top of or beside images from the real world. Distinguished from a Heads-Up Display in that the information in a HUD is presented as being on the surface it's projected on, whereas Augmented Reality is usually presented as "actually" being part of the world behind it. It's pretty much the epitome Real Life example of Goggles Do Something Unusual. Compare to The Metaverse, which may appear similarly depending on how its used. See also Stat-O-Vision, which is how this is often used in fiction. Dennou Coil revolves around a town set up for an Augmented Reality system which children have access to. Appears in Ghost in the Shell where cyberbrains allow people to add additional information into their normal perception of reality. Robotics;Notes uses Augmented Reality as a central element. An AI named Airi is only visible on the viewfinder of camera on tablets and cellphones since she exists in a computer network, a robot built by the Robotics Club uses AR to overlay an image of a Super Robot from the Show Within a Show over the robot's chassis and, of course, a Cosplay App ◊. In Iris Zero most people have a power called an Iris that basically allows them to view an Augmented Reality. Most younger people, anyway. In Battle Angel Alita, when Alita is surrounded by enemy covered by smoke bombs, Lou sends the location of her assailants and booby traps which superimpose on her vision. The eponymous Eden of the East has a phone app which uses augmented reality. Point the camera at anything, and it will give you any information Eden has on the subject. In fact, this particular app is what ends up helping Akira intercept the missiles threatening Japan. Rather than the holographic images seen in other series, Yu-Gi-Oh! ZEXAL portrays the monster duels through augmented-reality eyepieces. The general idea was that it would allow for more damage to the surrounding area, although they tended to forget about it after a while. Besides just the graphics handwave, an early episode had a hacker's supposed "evil scheme" turn out to be making a giant QR code. In the final chapter of Gunslinger Girl, Speranza uses a pair of AR glasses basically as a smartphone: talking to her mother, time management, navigation, and photo taking. The plot for Sword Art Online: Ordinal Scale involves the rise of AR technology as a potential rival to Virtual Reality, with the main conflict arising around the creation of a highly advanced AU game called Ordinal Scale and the darker purpose behind it. In Kyon: Big Damn Hero it's shown Mikuru was given an Augmented Reality system as a part of her conditioning (probably to help her with the culture shock). It doesn't seem to interact well with some movies. It's the way the SOS brigade can interact with Achakura. The California Voodoo Game uses this trope because they're outside of the Dream Park environment. The gargoyles in Snow Crash. They wear bulky outfits that allow them to carry a full suite of high-end surveillance equipment wherever they go. This allows them to look up information on the Internet with ease, as well as record and scan anything they see. They have a reputation for being freaks and loners. Members of the Daemon's "darknet" wear Cool Shades that project data from the Daemon onto the lenses, along with haptic gloves. The shades are keyed to their retinas, and the gloves to their fingerprints. These are used by the initial operatives to actively turn Real Life into a high-stakes Massively Multiplayer Online Role-Playing Game - carrying out missions to increase the Daemon's influence over the world result in "Character Levels" that grant them access to increasingly powerful devices and abilities. Eventually, the darknet becomes an entire civilization that is Invisible to Normals. Halting State by Charles Stross is set just after now and features glasses that give directions and handy pointers as standard for some of the characters. It also shows how this could be turned against the user by having the glasses hacked and fed misleading information, visual noise, etc. One cop is subjected to an attack via his glasses that leave him vomiting in a trashcan during a police raid. Most people in David Brin's Existence have goggles that allow them to perceive any of a thousand "layers" to the "mesh" over the real world. Some have contact lenses or even eye implants. In Accel World this is commonplace via "NeuroLinkers", essentially smartphones worn on the neck that alter the signals from the wearer's eyes. They can even be used to correct poor vision. "Wearables" in Vernor Vinge's Rainbows End provide this through smart contact lenses (among other things). You can build custom views of things, but most people prefer to participate in one of the many overlapping shared virtual worlds, usually based on popular works of fiction, like Discworld. (Vinge mentions that royalties from the Discworld virtual reality have allowed Terry Pratchett to buy up a substantial chunk of Scotland.) Basically, you can participate in a Massively Multiplayer Online Role-Playing Game while walking down the street. In Jacek Dukaj's Czarne Oceany (Black Oceans) it's possible to install a computer implant in one's brain, operated via an Augmented Reality interface overlaid on one's senses. It also allows the user to interact with the virtual avatars of an AI assistant or of other users, as well as to overlay various "skins" (e.g. Necropolis, Cartoon, Middle-Earth, Baroque) on the real-world environment to make it look more interesting. Geordi's visor on Star Trek: The Next Generation qualifies. As seen in the episode "The Heart of Glory", it sees visually but also overlays data about electromagnetic fields (such as the "aura" around Lt. Data, which he assumed everyone could see) and metal fatigue, which are not fundamentally visual data. Some helicopters in Fringe's alternate universe have an information service that works in this manner. Presumably it includes an overlay of massive three-dimensional block letters identifying your current location. The line-of-scrimmage and line-to-gain lines during American football games. Some ads on sports arenas work this way. The fans in the stadium see nothing, but a logo is projected onto the field/court/pitch for broadcast. This is especially useful for sports like tennis or association football that may go a long time between commercial breaks. From 1996 to 1998, the Fox network augmented its coverage of professional hockey games with FoxTrax, a combination of hardware and software that created a glow around the puck, making it easier for viewers to track as it moved around the ice. When the puck was passed or shot, the glow became a blue or red comet trail, depending on the puck's speed. Despite generally positive reception, the idea was ridiculed in some corners, so when ratings declined, Fox abandoned the concept just to be safe. The FoxTrax name was revived in 2001 when similar technology was applied to auto racing. The television coverage rotates from one car to another, and the display shows the driver's name, photo, and other pertinent stats, as well as the car's current speed and position. Collected data from the car's transponders can also be used to show the driver's course through each turn. Similar systems are used in Major League Baseball games, most commonly to show the course, speed, and placement of recent pitches. Broadcasts of golf tournaments have started displaying contour-lines overlaying grassy slopes, which makes it easier for viewers to tell how the course lies. Cricket commentary (at least in Australia) has been using variations of this for quite some time on television broadcasts. The earliest versions were simple light pens that allowed the commentators to sketch details they were talking about on a screen that would be made part of the broadcast note Typically saw more use in slower matches as the commentators tried to keep the audience's attention and/or themselves from getting bored. More modern versions integrate various computer infographics with the actual footage of the match rather than cutting away to a new screen, or overlaid on a replay to analyse particularly close umpiring decisions. A non-technological, Painting the Medium variation is used to represent Sherlock's Sherlock Scans in, er, Sherlock. His first impressions of people are rendered with annotations marking subtle details he's picking up from their appearance. Memories of the Alhambra is a Korean miniseries about an Augmented Reality video game in which players duel with Christian knights and Moorish warriors from 15th century Spain—but in modern-day Granada. Put on a pair of "smart" contacts and log on and you will see bad guys and good guys and guns and arrows and terrorists and pirates and zombies and all other kinds of cool stuff, all superimposed on the real city. Everyone who isn't playing occasionally stares at the people having imaginary sword fights in public. In one episode of The Ricky Gervais Show Karl comes up with something similar to this, saying that a person could have the world appear a certain way through a pair of glasses (e.g. somebody could have virtual graffiti over real-life walls). Ricky and Stephen tell him it's the stupidest idea they've ever heard. Eclipse Phase has this as part of a post-singularity future. It's so ubiquitous that people without at least some sort of external device for Mesh access (most Morphs come standard with implants) are considered one of the new disadvantaged classes and there's social services to get them connected. In Warhammer 40,000, certain privileged members and associates of the Adeptus Mechanicus are given the augmented eyes necessary to see and interact with the "noosphere", giving them access to some pretty sophisticated A.R. where the noosphere is available. The Fourth Edition of Shadowrun features a widespread acceptance of Augmented Reality, because it's a) the way the future seems to be leaning right now and b) it's finally a plausible way to get Hacker characters out into the field rather than essentially running two separate game sessions for them and the rest of the group. Advanced goggles and glasses in GURPS: Ultratech give lots amounts of information about everything around them including hyperspectral imaging of the environment. Endemic in Transhuman Space, with lots of interesting ideas about how it could be used. For instance, there's a popular restaurant chain called My Own Favourite Restaurant. The actual decor is bland, because it's a backdrop for what you want it to look like. It's mentioned that it's not easy (but still possible) to hack the glasses and implants, but it's relatively straightforward to hack the VR tags feeding them the information. In Hc Svnt Dracones UI lenses are used for AR but not necessarily that common, and are usually only worn over one eye so you can easily ignore the distracting overlays by closing one eye. You can also have an eye replaced with a Utilit-i implant that does the same thing, and can be plucked out for the Eye Spy trick. At the Futuroscope, the older attraction Les animaux du futur used augmented reality goggles to surround you with the animals from The Future Is Wild, including some crawling over the ride carriage itself. The PlayStation 3 has virtual pet game Eye Pet and the card game The Eye Of Judgment that both use the PlayStation Eye camera and overlay the games visuals on the video feed from the camera. The PSP would become the first handheld system to feature Augmented Reality with the aid of an add-on camera. Invizimals made a prime example of this feature. Its successor, the PS Vita, made the built in camera being used for AR games a major selling point. In addition to having a 3D display screen and a 3D camera, the Nintendo 3DS is the first Nintendo handheld video game console to incorporate Augmented Reality gameplay (via "cards"). The pack-in titles, AR Games and Face Raiders, take advantage of the feature, with both having added use of the built-in gyroscope. Nintendogs + Cats also takes advantage of the feature to let you play with your pets in the "real world", as does Pokédex 3D. Spirit Camera: The Cursed Memoir ships with a notebook filled with deranged imagery which the games uses and enhances through its story mode. Kid Icarus: Uprising uses collectible AR Idol Cards that can battle each other. Scanning each card also gives you its corresponding idol in game, saving you some time looking for random drops (of course, the cards you get from packs are random anyway, and it's much harder to find card packs at all than it is to get idols in-game. The Denpa Men and Pokémon Dream Radar both follow the example of Face Raiders, using the system's motion sensor to overlay game elements on the real world. Bravely Default comes with AR cards that allow you to view short scenes based on the card. There's also a Sequel Hook movie available after the credits that makes good use of it. Pokémon GO uses the trope to display Pokemon, both wild and owned, in your surroundings. Geomon runs off this trope using your real geography, weather, season, and time of day to find and fight monsters. 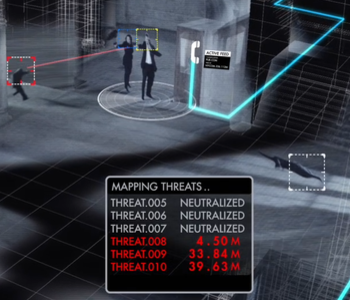 Ghost Recon: Future Soldier features this; Augmented Reality is used as a justification for the player's HUD, with waypoints, ammo counters and maps being displayed. Borderlands and Borderlands 2 use a similar justification. All of the data on the player's HUD, including ammo, weapon stats, minimaps, and enemy health/shields/armor are displayed by a device called an "ECHO" given to the player at the start of the game, either free of charge from a semi-friendly Mega-Corp in the first game, or totally not looted off this corpse in the second. A number of promotional games make use of your webcam and AR cards to play special content. There was a Lord of the Rings trading card game web-based AR special that made use of a Collectible Card Game foil special of a Balrog with a specially marked back for such special content that was distributed as a freebie with some CCG magazines in 2010 or 2011. In Jazzpunk, the Fantastic Drug Missionoyl claims to have this effect, although what exactly it does is unclear since the captions and floating HUD messages start appearing before you ever take it, and some of them are clearly meant for the general public to see. On a less ambiguous level is the frog's hacking device, a visor that shows wi-fi data packets floating through the air (among other things) and allows the player to "grab" them with a mechanical frog tongue. Remember Me has ubiquitous use of AR. Since everyone in the setting has an implant capable of manipulating their visual input, the air is saturated with store advertisements, warning signs and visual representations for invisible actions like data transfers. This has detrimental effects as well, apart from the game's premise of memory rewriting - capable users can hack enemy implants to stun or incapacitate them by sensory overload or to become invisible themselves. Ingress is a mobile app that displays locations in real life as "portals" that XM come out of, and may be the start of a hostile alien invasion. This is one of the explanations given for why Laurentia in Nexus Clash is a modern-tech Urban Fantasy setting when the city itself was supposed to have a much higher tech level. A lot of the more advanced systems in the city had augmented reality interfaces, but most of the human knowledge base needed just to keep those interfaces running were lost when the world effectively came to an end. There are a few city systems that are still running, which don't provide an explanation for who or what is maintaining them. Neocron, being a cyberpunk MMO, made it's HUD an example of this by explaining that it is the result of the player character using the RPOS implant. Doubles as a case of Exactly What It Says on the Tin given what the acronym stands for: Retinally-Projected Operating System. In Horizon Zero Dawn, Aloy finds a device called a Focus as a young girl that gives her an AR view. She makes extensive use of its abilities throughout the game: it can reveal hidden loot, highlight the vulnerable parts on enemies, provide on-screen navigation aids, interact with ancient computers, and a host of other functions. Yo-kai Watch World is a Pokémon Go inspired mobile game where you meet and fight yokai in real life locations. While it's not part of the actual game itself, Riot Games (creators of League of Legends) have used augmented reality in their biggest esports events- namely the 2017 and 2018 World Championship Grand Finals. In 2017 the Elder Dragon swept down on the Beijing National Stadium at the climax of the performance the tournament's theme song, "Legends Never Die'. In 2018 Riot went one better during the live performance of in-universe Fake Band K/DA's debut single "POP/STARS" by having not only the performance artists but also the actual characters themselves performing live on stage - Ahri, Kai'Sa, Evelynn, and Akali, a collection of four of the game's most stunning beauties, dancing and singing for the crowd. Sight is about a world where people have a chip in their eyes that provides augmented reality. H+: The Digital Series , is built around this technology. In Avalons Reign, people can get ocular implants called OSIs that impart this function. This TEDTalk shows one such system developed by MIT. This one shows a good example of Augmented Reality maps as seen through phones. Several mapping applications on the iPhone have similar Augmented Reality functions, such as the Yelp! app. The latest version of StarWalk uses the iOS Device's camera to determine the location of stars, satellites and other astronomical features in real time. LEGO Stores have cameras set up where if you held certain sets up to the camera, it shows an animation of the completed set played sitting on the box itself. Google Glass is a Smartphone-like device which attaches to eyeglasses, allowing for this in real life. Its uses range from updating Facebook to loading maps to taking photos from the wearer's perspective, giving the wearer a Heads-Up Display. Privacy concerns have arisen due to the creation of certain facial recognition programs, which veer further into this trope. In Jan 2015 Microsoft unveiled their HoloLens project combining smartglasses with their motion sensing tech so that you can manipulate virtual objects with your hands. In order to promote Godzilla (2014) at the 2010 Comic-Con, Legendary Pictures gave out T-shirts showing Godzilla concept art that would have him using his atomic breath when viewed through a special webcam at the Legendary Pictures booth.